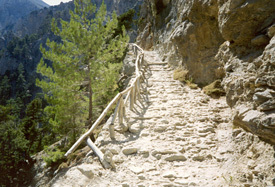 Crete enjoys a typically Mediterranean climate with mild winters, hot, dry summers and approx. 3,000 hours of sunshine per year. Average temperatures range from a winter low of 12 degrees C in January rising slowly to 21 degrees C in May and 27 degrees C in July. 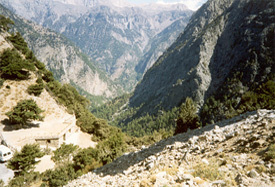 The autumn average is around 21 degrees with temperatures in December around 14 degrees C.
The gorge of Samaria (right and left) is situated in the National park of Samaria, in the White Mountains in West Crete and is said to be the longest gorge in Europe. There are around 2,000 species of plants on the island (157 of them being indigenous to Crete) and some of these you will only otherwise find in Africa and Asia. Pine forests, gorges, cavern pits and plateaux also feature on the island and views of the magnificent mountains can be enjoyed from many places including our villa "Petrino Dream". Plaka - It is approx. one kilometre to the village of Plaka from our villa and here you will find local tavernas and a supermarket. Kokkino Chorio - this historic village is a wonderful base from which to go sightseeing or simply to enjoy a relaxing holiday on the island of Crete. The peaceful narrow lanes, old houses and the village square were made famous some 30 years ago when they became backdrops for parts of the well-known 'Zorba the Greek' movie. 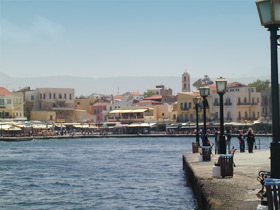 Chania - known for its beautiful Venetian harbour, this old port is the town with the nearest airport to our villa - approx. half an hour by car. Chania (pronounced Hania) has an abundance of old historic buildings, churches, museums and craft shops with superb local produce on offer. There are also numerous cafes and restaurants where food of a great variety is served. The atmosphere in Chania has a touch of Florence and at different times of day, the light produces different effects on the water and historic surroundings and adds to the magical ambience. 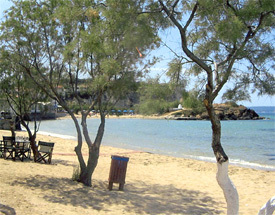 Chania is the main centre of western Crete. World War II remnants - there are many historic remnants from the war and a fascinating afternoon can be spent exploring these ruins and visiting the caves, most noticeable of which are the 'Elephant Caves' with their beautiful stalagmites and stalactites of various shapes and colours. The War Cemetery at Souda Bay is also well worth a visit.